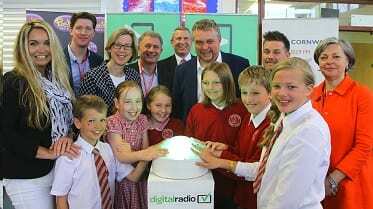 The launch of new digital transmitters that have transformed the availability of local radio services on DAB digital radio for listeners throughout Cornwall was celebrated at a special ‘switch on’ event at Charlestown Primary School in St Austell this morning (Friday, April 21). Steve Double, MP for St Austell and Newquay and Sarah Newton, MP for Truro and Falmouth, pressed the big green digital radio switch at 08.45am to signify the expansion of local DAB coverage in St Austell and across Cornwall in front of pupils and staff from Charlestown Primary School and representatives and presenters from Cornwall’s local radio stations. The expansion of coverage means that many listeners can now receive six further radio stations - BBC Radio Cornwall, Heart South West, Pirate FM, My Music Radio, Capital and Gold - on DAB digital radio for the first time. The new transmitters have transformed DAB digital radio coverage throughout Cornwall. Nine new transmitters have launched in the past ten months - including one serving St Austell where this morning’s celebration took place- and a final transmitter will launch in Bude in the coming weeks. The ten transmitters bring the county’s popular local stations to 325,000 more listeners on DAB digital radio in Cornwall and have expanded local DAB coverage to 91% of households from 41%. Listeners in Cornwall are encouraged to retune their digital radios to ensure they receive all their available stations, including the county’s local stations, on DAB. (See Notes to Editors for further information).